“We tried to keep it a bit low key… I didn’t want to say ‘Oh my dad’s in the same company as me,’ I didn’t want all the attention – but it got round pretty quickly,” says Dominic Foster. 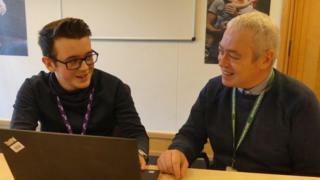 Dominic left school in Peterborough in 2018 after A-levels and he and his dad have ended up doing the same apprenticeship at the same company through very different routes. John Foster was already working as a call handler for RSA, one of the world’s oldest insurance companies, when Dominic applied for an apprenticeship in the claims team. After a gruelling three-hour interview, Dominic was hired and this inspired his dad to go for the apprenticeship programme for existing employees – and he was hired too. “We’re neck and neck but still in the very early stages of the curriculum,” says John. John first joined the company in 2017 after health issues forced an end to a 30-year career as an electrical engineer, both on the road and in technical support. He left school at 16 but picked up a string of qualifications later in life, including an HNC in electrical engineering: “I did it the hard way,” he says. “Ooh – you’re are going to open up a can of worms there, I think,” says John. His dad has the edge for example: “when it comes to looking for pipes in a building, finding out where a leak’s coming from”. But when it comes to the book-learning part of the course, Dominic is top dog, having done A-levels so recently. John, who’s 47, agrees his son is very good academically: “He would be faster at absorbing the material and retaining that material, whereas me being a bit older, I have to write a lot more down to try and retain it. Luckily, direct comparison is difficult as they work in different teams within RSA – but the company confirms they’re both “very good employees”. Image caption A future as a web developer? Living in the same household means they can go back and test each other, “revise, bounce ideas off each other, if there’s something we don’t understand… and just sometimes help it click into place”, says John. Once they complete their current programme, they will both be eligible for a degree level senior insurance professional apprenticeship, but otherwise the pair look likely to move in very different directions. Dominic says the good thing about the programme is that it has allowed him to move round different departments in the company. 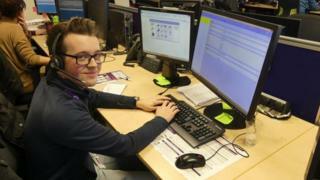 He particularly enjoyed his time with the digital team and he thinks his future might be there, perhaps as a web developer. And John wants to maximise use of his technical and people skills, gained from his years as an engineer. “I want to be more on the project management side for the higher value claims. Such a move would bring him in a full circle, he says, back to when he was a travelling engineer, face-to-face with customers. John says he would definitely recommend it as an older person, “obtaining the knowledge as you go through the job” to gain formal qualifications. Dominic says he got what he wanted when he decided not to go to university – on-the-job training “in the real world, getting real life experience… a qualification… and a lot of progression”.